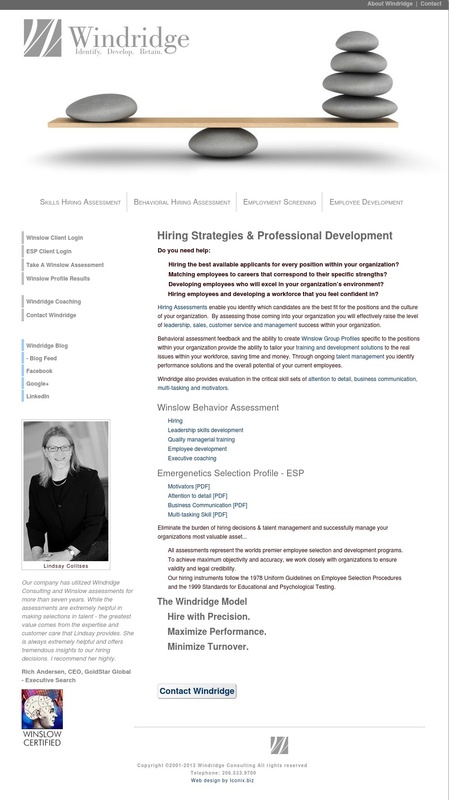 Windridge Consulting is a professional hiring and coaching consultancy formed in 2001 based out of Edmonds, WA. Founder Lindsay started her company to help human resource professionals, recruiters and business leaders make confident and objective hiring and employee development decisions. Windridge Consulting desperately needed a new brand, and a new UI to match the company’s vision. We needed a way for prospective clients to easily navigate the site to learn about resources, assessments and coaching to ultimately become a user. Using light, airy and logical branding, users now easily understand what Windridge offers. By redesigning the product and service pages, users can better find and purchase what they need. And finally, a thought-leadership blog rounds about the website.